In our everyday lives, we often come across products that seem to “get” our needs and work perfectly. While many such innovations are built by for-profit companies, that certainly does not need to be the norm. For example, in technology, while Google is the clear innovator in the internet search domain, Wikipedia, a non-profit, has created an entire ecosystem of community curated content on nearly every topic under the sun. The social sector, which is looking to solve the gnarliest problems at a global scale, from clean water to education to financial inclusion, deserves our most transformative ideas and innovations. Our problems require a fresh approach from an innovation lens, rather than a scarcity mindset. As social sector innovators, we should thus feel enabled, even obligated, to create joyful, transformative products, interactions and experiences that build the same the feeling of “where have you been all my life” in our beneficiaries, partners, customers, clients. With our unbridled access to information, tools and resources today, this is very possible. How do we go about creating these innovative solutions? How do we move diverse organisations and teams towards this common vision? How do we motivate our own selves to not settle for good enough? There are many, potentially interrelated frameworks (human centric design, lean startup approach and so on) which help us address these questions around excellence in innovation. One of the prominent ones is called the Design Thinking philosophy. The idea and adoption of Design Thinking initially came from the software industry, but over the last decade, has gained traction across other domains. Among other organisations, the Stanford University’s d.school is a very prominent thought leader in this space. There are multiple approaches to describe the Design Thinking process. 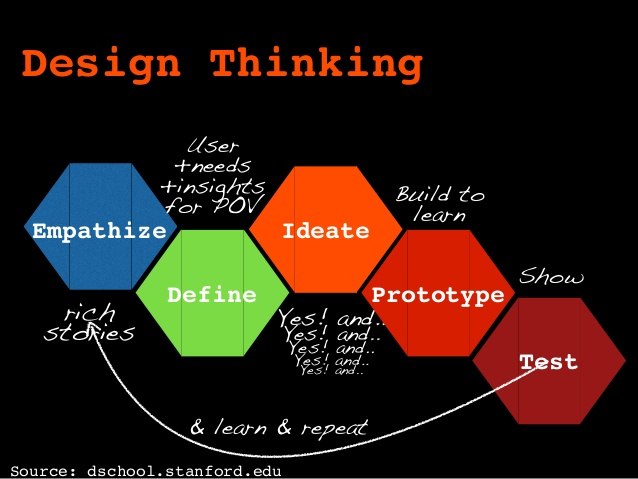 Stanford d.school’s framework has 5 stages – Empathy, Definition, Ideation, Prototype and Testing. At a cursory level, these phases sound fairly intuitive. What’s critical to understand in Design Thinking, however, is the non-sequential nature of these five stages – they are dynamic, potentially overlapping phases, NOT a linear process. 1. Empathy – This phase, when introduced, proved to be a key differentiator between the traditional, bounded design processes and the Design Thinking approach. In the past, Designers / creators would observe their end users to evaluate their needs around a problem area – despite best intentions, this could be reduced to a clinical, detached exercise that created functional products without transformative, joyful customer experiences. But empathising with their circumstances, ecosystems and workflows takes the caliber of designing and solutioning to a whole new level. There are beautiful examples of empathy dynamically impacting innovation in the social sector. Consider the Gandhi Fellowship program run by Kaivalya Education Foundation. Gandhi Fellows begin their journey with a community immersion phase – this is not about observation, it’s about walking in the shoes of children, whose school experiences the Fellows are looking to transform over the next 2 years. Starting with this level of empathy gives us an unparalleled lens into the domain. We grasp all aspects of the problem with clarity, from a space of positivity, rather than judgement, drastically elevating the quality of our solutions. 2. Definition is where we internalise everything we’ve learnt in Empathy about the problem space and probe and poke at the underlying questions to shine a light on the ones that truly matter. For example – how do we introduce online courses in a community without reliable electricity? This could be the core question in a traditional design approach and the resultant ideation phase may come up with ideas such as solar powered batteries for laptops. But with Design Thinking, we start to explore the dynamics of learning and teaching in such schools. How do they function? How do the students learn? What would online courses do for these learners? Thus, rather than purely looking at the problem from a technical standpoint, we’d be able to understand the entire ecosystem in such communities and explore deeper issues around learning, not just the surface question of technology delivery constraints. 3. Ideation – This phase is far more than someone “creative” putting down ideas on the back of a cafe napkin. Instead, it requires unbridled creativity and in order to be effective, should truly be about co-creation in a safe space, without judgement. Once the critical questions have been prioritised in Definition, what are ALL the ideas on the table from participants to solve them? Multiple approaches (such as worst solution, quick draw etc.) could be used to frame the process of collecting ideas from the entire team. The broader the viewpoints, the more innovative the ideas that come to the table. In the prior example, thinking through adaptations the community has made to compensate for lack of electricity would be a critical perspective to bring into ideation process. 4 & 5. Experimentation – Prototyping and Testing: In these two phases, all the creative ideas are converted to prototypes and tested with real users to capture feedback. Most of the ideas will fail – being aware of that, while keeping the momentum for the next round of prototyping requires intense grit and resilience. One also needs to develop the intuition to be able to see what aspect of the prototypes failed and what requires additional testing in future iterations. An example of a fearless experimenter is Arunachalam Muruganantham, who took on the challenge of inventing a low cost sanitary napkin for women in his family and community. Going out of his way to live in the shoes of menstruating family members for several years of his life and his intense experimentation with source materials took his product design to levels that a dispassionate team at a pharmaceutical company never could. 1. Enable the entire organisation to think as designers in the creative process: You, yes YOU are a designer. How often have you said – “this is so great, I wish I was creative enough to come up with this visual or story or work product” Or – “I’m not creative at all, my inputs to this discussion won’t add value”? In order for an organisation to produce game changing products, everyone involved in the problem ecosystem must be encouraged and enabled to think of themselves as an equal and valued designer and creator. This could be an organisational or personal barrier that team members may need to overcome, but it is a critical first step to enable an organization towards transformative innovation. 2. Leverage the power of the tribe: Design Thinking only works when diverse voices and perspectives are brought into core phases such as Ideation and (co) Creation. It is critical that each of these voices is brought in and truly heard. The more perspectives we bring in to examine the problem statement in the beginning, the deeper we are able to understand and co create solutions with high chance of adoption. For example, if we are looking at the problem of affordable urban play spaces in India – voices as varied as care givers, children, architects, urban planners, sports practitioners, teachers, school administrators, even waste recyclers all could have huge value and perspective in understanding the core questions and then, what potential solutions will actually gain traction with children while keeping costs, accessibility, maintenance and other diverse issues in mind. 3. Don’t settle for mediocrity, don’t wait for “perfection”: Design Thinking is a living, evolving philosophy that helps us gain a deep perspective into a complex problem space. With a more static, linear approach, we would try and understand all aspects and underlying questions before attempting to ideate and create comprehensive solutions. However, there is a high chance that the foundational circumstances could have shifted by the time we have a fully baked and functional solution. Design Thinking instead promotes deep exploration of the circumstances of our end users, with sincere empathy. This then lets us rapidly ideate, create, prototype and test different solutions – solutions that don’t resonate with users get discarded and we re-examine their problem statements again, having learnt from both the successes and failures of the previous iteration. Make no mistake – constantly staying focused on innovation is hard, changing organizational mindset and routines to drive innovation is even harder. And frameworks, including Design Thinking, can help pave our way of working towards this ambitious goal. There will be moments where we feel like our disruptive ideas are getting no traction in the ecosystem. But these are minor setbacks compared to our end game of solving the world’s most pressing problems. We must refuse to settle for anything less than transformative, joyful product / solution experiences for our end beneficiaries – only then can we co-create big, impactful social innovations. Additional sources for reference re Design Thinking: Please explore the resources on Stanford d.school’s websites (including their YouTube channels) for richer content including case studies related to Design Thinking. Parvathy Ramanathan is a Principal in the Transformative Advisory team, working in our Bangalore office. She has a background is in launching technology products, with a focus on data and analytics. She has worked in several sectors in startups (Poplicus, Appature) and larger companies (Amazon, IMS Health, McGraw Hill etc). She is an Engineer from RAIT, Mumbai University and has an MBA from the Kellogg School of Management.